Treetops is in a lovely quiet position surrounded by a pinewood forest on one side, overlooking the tennis courts on another with the swimming pool on the third. The Praia D'el Rey Championship Golf Course, the 5 star Marriott Hotel with restaurant, leisure, gym and spa facilities and unspoilt beaches are all within easy walking distance. 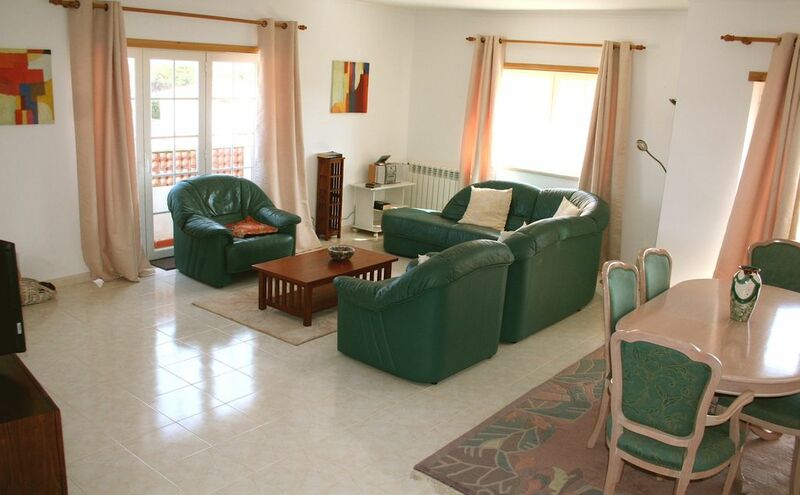 This 3 bed 2nd floor luxury bright self catering apartment offers space, sunshine and shade. It is suitable for families, golfers and tennis enthusiasts or for those seeking a relaxing holiday based on a beautiful resort by the sea and amidst an unspoilt part of Portugal, rich in culture, history and culinary treasures. The ancient town of Obidos is a 15 minute drive away, while the surfing resort of Balleal with its restaurants and bars is a 4 mile walk along the beach or a short drive away. The golf in the area is sensational with 4 championship courses - Praia Del Rey, Royal Obidos, Bom Successo and the new West Cliffs - within a 15 minute drive. The apartment is very spacious with a total of 170 sqm living area. There is a large double bedroom with an en-suite bathroom, 2 twin bedded rooms, a master bathroom and an additional washroom with WC. The terrace overlooking the pool is ideal for BBQs and the south east facing terrace off the lounge overlooks the tennis courts and benefits from the sunshine throughout the morning. The apartment is equipped with all that you might expect for modern day living, including free wifi. Simon and Trudi live in Leamington Spa UK and purchased the apartment in 2007. In 2015, friends Julian, Marianne and Andrew took a share in the apartment and all now enjoy the joys of the Silver Coast throughout the year. The apartment was very clean and tidy,had everything you needed plus more,very spacious. The apartment was lovely,a little dated but very clean and tidy,lovely hot showers,overlooking a nice pool,2 nice terraces,this apartment is huge plenty of room for a family or adult group. We had a lovely late summer break in a nice quiet resort that had some amazing golf courses and close enough to the sea if you like water sports also. Great comms with owner before arrival and delighted with apartment - massive, clean and well equipped. Local beach is stunning, lots of great places nearby to see, things to do and spots to eat. Very clean, spacious and well equipped property. Central location and lovely shared pool. Would definitely consider staying again in the future if we were visiting the area again. In a peaceful setting, but still within walking distance of all the amenities on the prestigious Praia D'El Rey complex. Extremely spacious and comfortable apartment - ideally suited to both golfing groups and families. The apartment is clean and impeccably maintained by the current owners. As well as the first class facilities on site, a number of bars and restaurants are just a short drive away. For golfers unfamiliar with the area, Praia D'El Rey is an amazing golf course and the equally impressive Ballesteros designed Royal Obidos is just a short drive away. Highly recommended and I look forward to returning for my 4th visit next year. In October 2010 and 2011 Praia D’El Rey was crowned Europe’s Leading Golf and Leisure Resort 2010 at the World Travel Awards, and several world class surfers stayed in the resort during the 2010 Rip Curl Portugal pro surfing competition, held nearby. Less than an hour from Lisbon airport, Praia del Rey, the 'beach of kings' is a championship golf resort, with a tennis centre, on mile after mile of beautiful, unspoilt beaches. There is a 5 star Marriot Hotel with restaurant, gym and spa facilities on the resort. Visit the resort website on http://www.praia-del-rey.com for details of what is on offer and watch the 3 videos to get a full impression of this beautiful location. The ancient town of Obidos is 7 km away. Obidos lagoon is ideal for very small children, and there is fishing and watersports available here. The surfing town of Baleal is a 4 mile stroll along the beach or a 15 minute drive away. Peniche, with it`s many restaurants is approx 20 mins away by car or taxi. 1. Praia Del Rey: http://www.praia-del-rey.com/en/the-golf-course/the-couse-guide.html - A world Top 100 golf course and arguably one of the most stunning golf courses in Europe. It's set among extensive pine forests and undulating dunes, with spectacular views over the Atlantic and the Berlengas Islands beyond. 4. Royal Obidos: http://www.royalobidos.com/ - a brand new course of 7,100 yds designed by Seve Ballesteros and opened in January 2012.